The Regional Institute served as a consultant to the University at Buffalo Office of Institutional Analysis and the UB Office of External Affairs to assess the university’s economic impact upon the Western New York region and New York State. The report, completed in April 2007, assesses UB’s quantitative and qualitative impacts upon the region and state, and analyzes the projected impacts of UB under the university’s strategic plan for growth (UB2020). The project will also offer a preliminary plan for development of a data management system to facilitate regular economic impact assessments of UB. 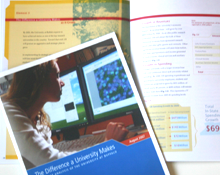 The Regional Institute completed an updated economic impact analysis of the university, released in January 2009.